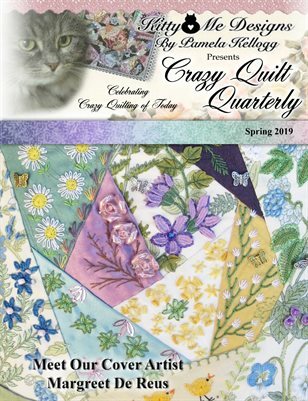 The Spring 2019 issue of Crazy Quilt Quarterly magazine features Margreet De Reus as our cover artist. Her beautiful cover design is a gorgeous expression of everything that Spring has to offer! Also in this issue, quilts by Gen Tracey, a lovely heart block by Renee Younger, a tutorial by Mary Anne Richardson, Spring graphics from Debbi Oeltjen, a crazy quilt bird tutorial by Janese Morris and a cute pink pumpkin by Janese as well. Betty Pillsbury has a shared gorgeous quilt that she made in 2009 and we have a CQJP block by Kathy Billings, an antique crazy that is available for purchase and eye candy by Darlene Kliewer and Angela Grasse. And don’t miss the Bird Ornament pattern and tutorial by Kathy Shaw and Mary Anne Richardson. Last but not least, be sure to read Jerry Everard’s article on the seam rippers that he makes! This issue is filled with inspiration!